Annette Betcher, Animal Communicator, Specializing in Horses! Interested in Astrology, visit my husbands new website, you can find it here! Be sure and check our Scheduled Events page for a survey on an upcoming teleconference. As an adjunct to Annette's consultations she is now including human babies and young children to her communication repertoire. Please ask for details ... 509-246-6415. Annette is an internationally acclaimed Animal Communicator and Intuitive Consulatant. Animals and humans have benefited from her ability for over thirty years. Annette, welcomes all animals, including missing animals and those in spirit. Annette believes that the association between animal and human has always been special. Like any developing relationship, it's success depends on awareness and communication. In order to better serve animals and their human caregivers, Annette has developed a form of communication that she calls "animal intuitive communication therapy". When an animal caregiver contacts Annette for a consultation, she immediately communicates the caregivers questions and concerns to the animal. Annette's goal is to accurately identify the root or source of the concern from the animals perspective. Once the source of the concern has been revealed, the resolution becomes easier. Animals and humans are comfortable with Annette's easy and gentle approach. Clients have commented that a consultation with Annette is like conversing with an old friend. 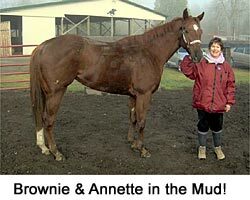 Annette is proud of her long and successful "hands on" association with all aspects of the thoroughbred industry. She has also enjoyed her years as a breeder of purebred dogs. She feels these experiences have served to strengthen her ability as an animal communicator. Annette says "I love my work and I feel I am good at what I do". It is so satisfying to know that animal and human are on the same page. "Awareness is key to understanding."